The present world is built on communication. We can easily communicate with the whole world through Internet and special devices. We can easily communicate with people from other continents via the Internet using special devices. A digital web camera is one of the main such devices. We will talk about the features of webcams, as well as how to choose a cool web camera in today’s article. A web camera is a compact camcorder that records the received images and transmits them via the Internet. You can take photos with such device as well as record videos. The first webcam started working in 1991 at Cambridge University. Digital equipment manufacturers gradually began serial production thereafter. Webcam matrix is one of its main components. It consists of light-sensitive elements, thanks to which the image is formed. The two main types of matrices CMOS and CCD are produced now. Each of this type of matrices uses its own digital signal processing method. The signal can be processed immediately with all elements in the matrix SMOS. Processing is carried out successively each element in the matrix CCD. Matrix СMOS have higher speed due to its specificity, but their image quality is lower than picture quality on CCD matrices. It plays an important role in professional photos, but for webcams, these differences are not as critical, so you can choose any of the types of matrices. A webcam matrix resolution is the number of dots (pixels) that are placed on it. Image is better and clearer if the matrix has a higher resolution. By the way, you can also read about resolution in the article about foto frames. – Webcam resolution 640 x 480 – that is 640 pixels long by 480 pixels wide. Resolution is often measured in megapixels, such as 640 x 480 pixels is 0.3 megapixels. Such resolution may be called standard for such devices. It is enough to send a quite good video, but to get a good photo it is not enough. – 1280 x 720 – it is so-called HD resolution. Pretty decent quality video is available at this resolution, although the photos are still mediocre. HD webcam is a pretty good combination of price / quality. – 1280 x 960 or more. This resolution allows to obtain very high quality video (up to Full HD). Photo with such resolution will be good enough, although they do not hold out a bit to the picture quality of the foto camera. It should be noted that comfortable using of webcams with high resolution requires high speed Internet connection. Webcam matrix characterizes its ability to transmit an image depending on lighting conditions. Great sensitivity provides a better picture in low light conditions. Unfortunately, almost all cams have not very high sensitivity and this parameter does not play a special role in the selection. This parameter indicates how many frames per second webcam can transmit. High frame rate can make the picture livelier. Minimum permissible webcam frame rate is 24 frames per second, although it is better to choose a camera with a frequency of 30 frames per second. A very good webcam can have frame rate 40 f/sec. Almost all digital webcams are connected to a computer via USB ports. You need to pay attention to the class of supported USB, often it is USB 2.0, but for cameras with high resolution may be required USB 3.0. So please check your computer USB version before buying. There is also possibility of using a wireless connection of webcams to your computer (Wi-Fi). Special wireless Wi-Fi webcam can be used if your computer supports this connection. Ability to work in the dark. 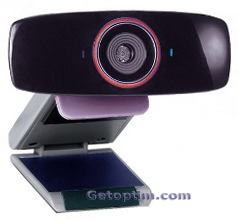 If webcam have special infrared sensors (night vision web camera), it can shoot in very low light or in the dark. This feature can be useful in security webcams. Webcams get new advanced features (e.g. face recognition) each year. It is possible that in the near future communicating via webcam will be more frequent than communicating via mobile phone or these devices will merge into one. We hope that now, after reading the article, the choice of webcams will not be difficult for you and you will buy the best webcam for pc soon. I simply want to tell you that I am new to blogging and site-building and truly loved your web blog. More than likely I’m planning to bookmark your website. Web camera is a necessary thing for PC, but in tablets and phones it is built in.